Sometimes temptation is too much to resist . . .
Our Revolving Book Week continues today with one more book! AND IT’S A SIZZLER! AND IT’S FREE!!! 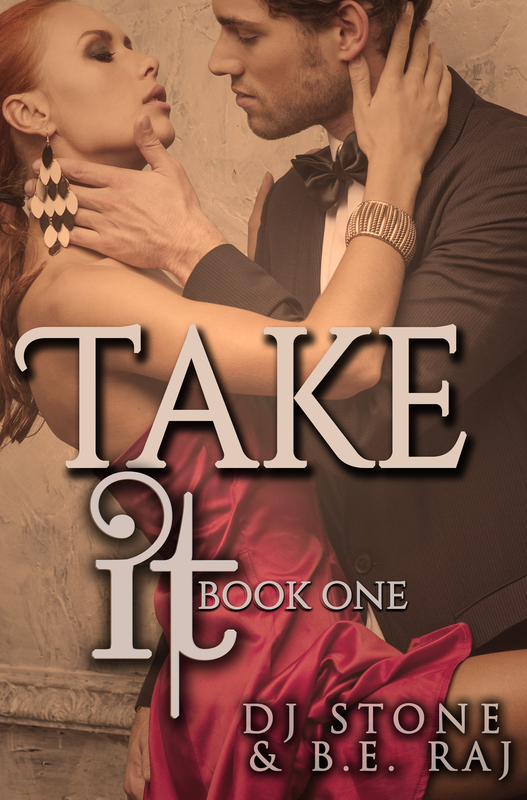 It’s the hot contemporary romance TAKE IT – Book ONE by DJ Stone and B.E. Raj. BLURB: Jenny Collins is convinced she’s more likely to find Bigfoot in the middle of downtown Boston than have a decent romp in the sack. She’s starting to wonder if maybe all the lackluster love making has more to do with her than she’s been willing to admit. Her days are spent drudging away in a male driven career where the best she can do is apologize for existing as she inches her way up the ladder. Just as she’s about to throw in the towel, a chance encounter with a captivating stranger has her holding onto the hope that her thirst for passion may be quenched. The only problem is the stranger, Harrison Burke, turns out to be a colleague. Sleeping with him would be highly unethical and probably illegal, which only seems to make her want him more. After Harrison convinces Jenny that nothing will ever change in her life unless she learns to take what she wants, she jumps head first into a sea of unimaginable pleasure and lust. Will she be able to survive the storm that ensues or will she be so blinded by the frenzy of passion that she doesn’t even see it coming?